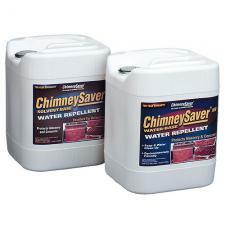 ChimneySaver Brick Water Repellant in water-base and solvent-base formulas, each warrantied for 10 years. The water base is the most popular for a few reasons. It can be applied to damp surfaces, it is VOC (environmentally) compliant which means it can be used outside without a respirator and it has no chemical odor. Each gallon covers approx. 100 sqft.